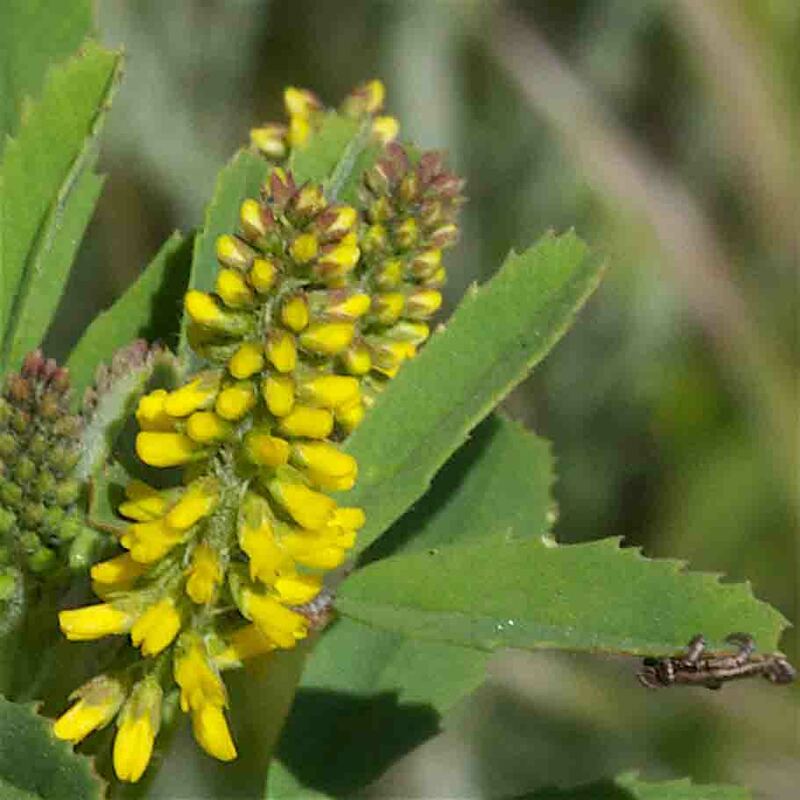 Generally prostate and more or less mat-forming; an invasive weed, especially in grassy areas. 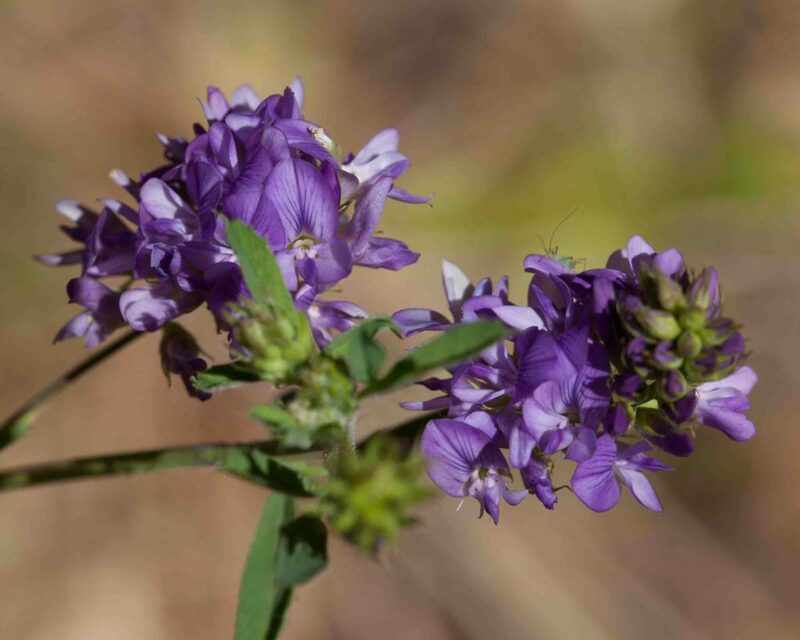 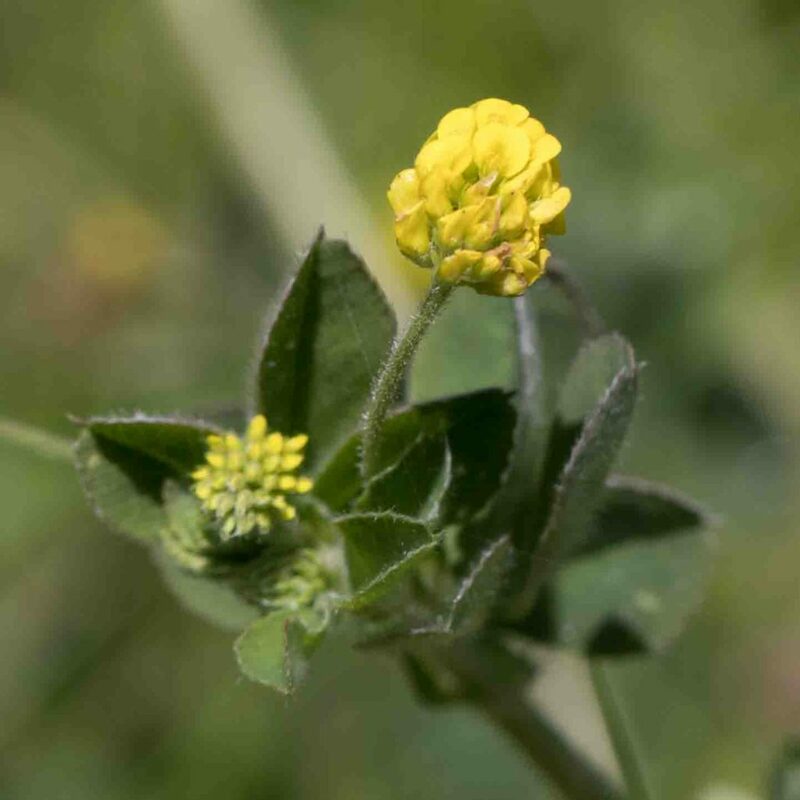 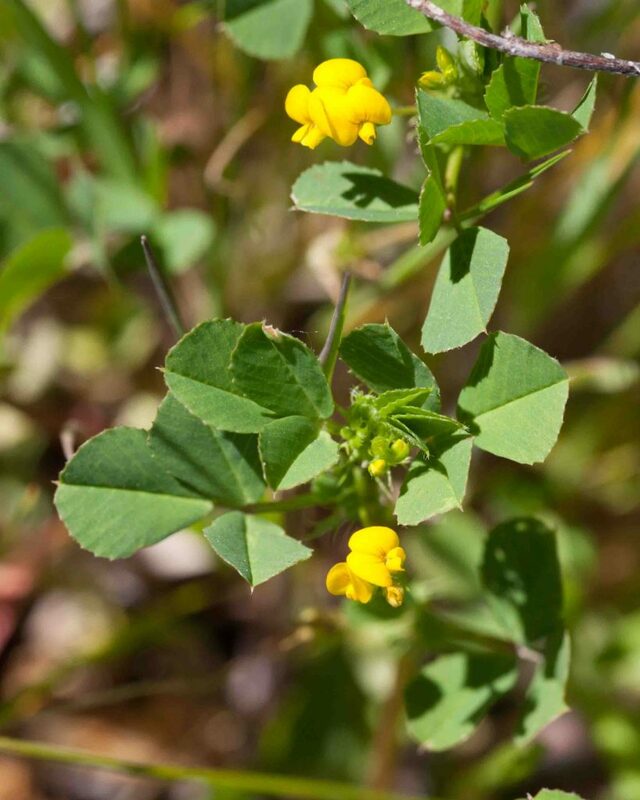 It has small yellow flowers and wedge-or heart-shaped leaves. 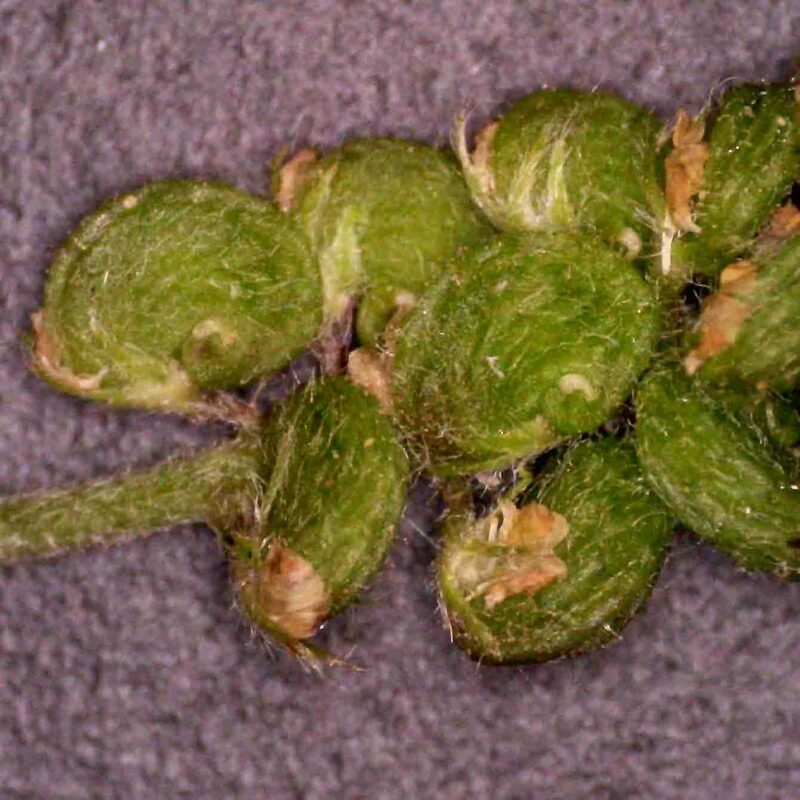 The fruits are small spiral burs which readily attach themselves to passing animals—especially those with short legs and long fur. 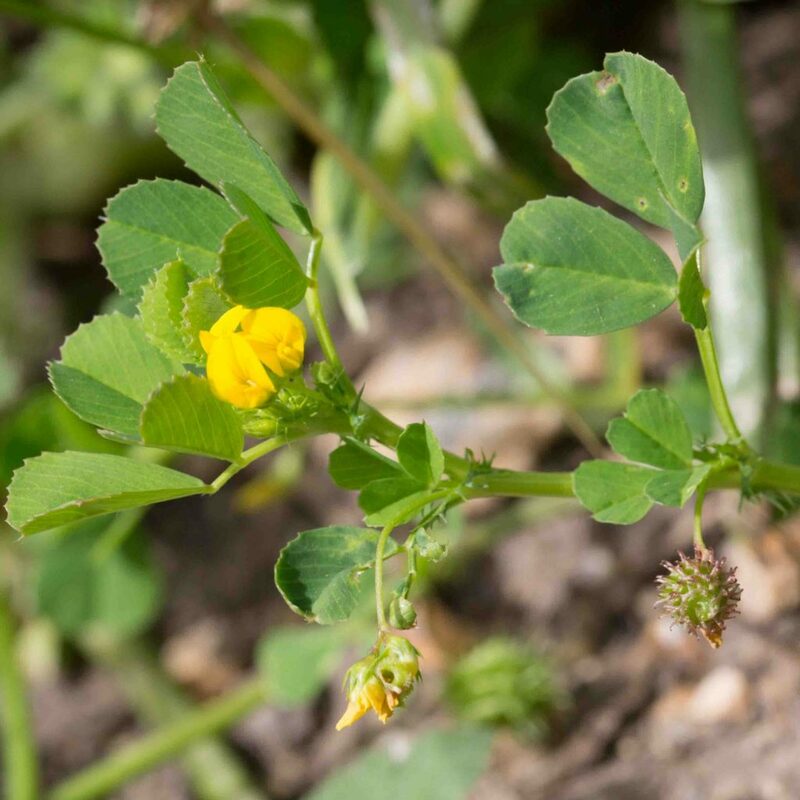 Less common than Bur-clover (Medicago polymorpha) but with similar flowers but leaves that are as broad as they are long. 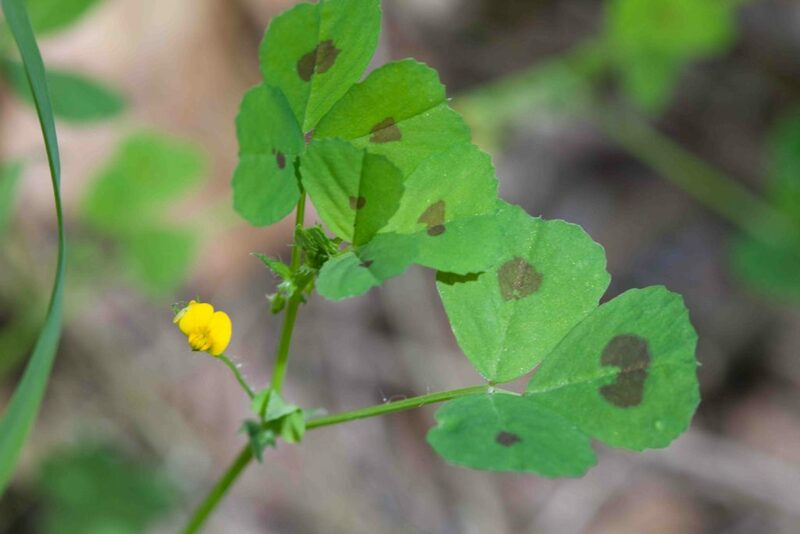 The easiest way to distinguish the two species is by the dark blotch to be found in the middle of the leaves of this species. 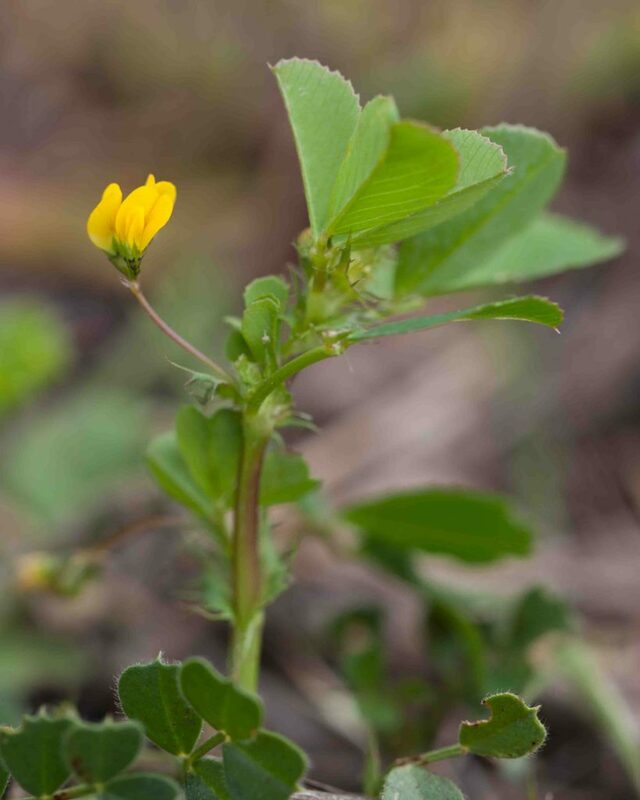 Less common than the Bur-clovers (Medicago arabica & polymorpha) and rather different in appearance with a small clover-like head with bright yellow flowers. 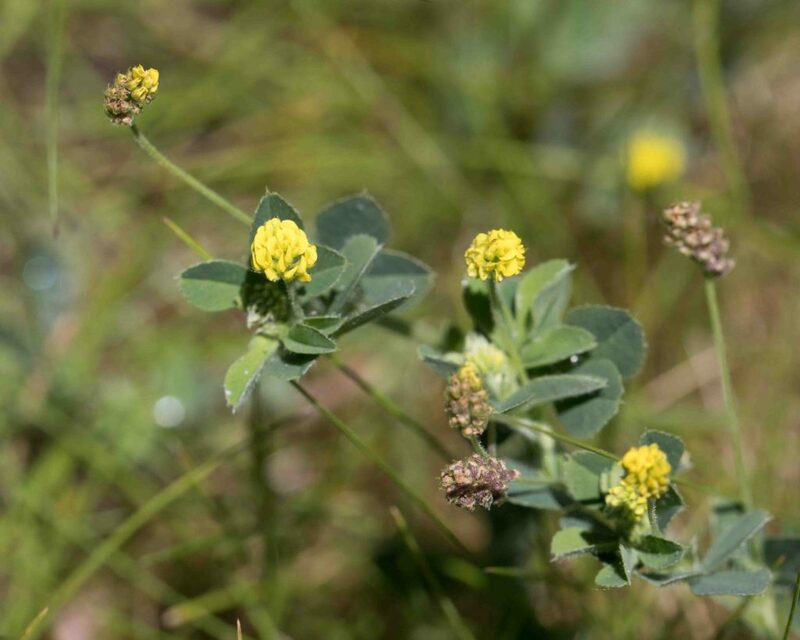 On closer examination the individual flowers are more like those of the Bur-clovers than the clovers and the head becomes elongated during flowering, leaving a short spike of fruits. 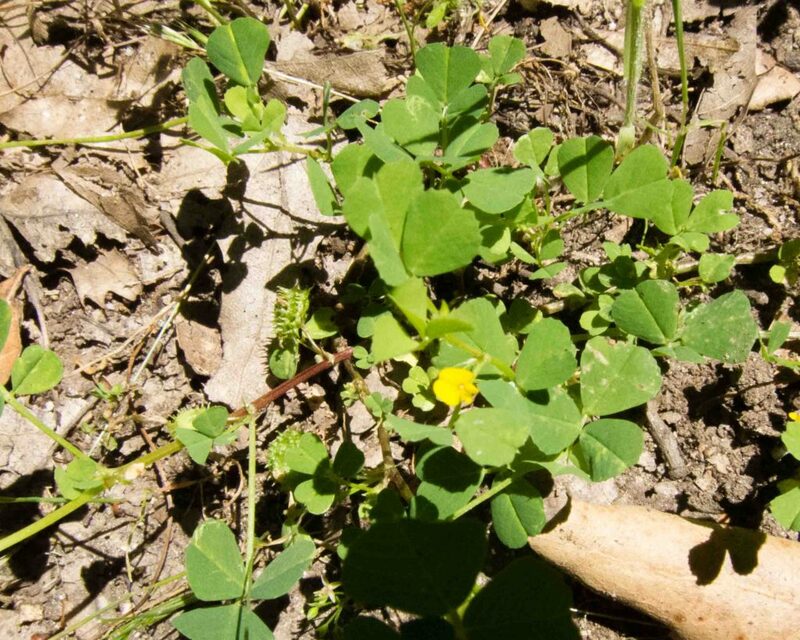 These are distinctive, not forming a burl like the Bur-clovers but kidney shaped, slightly hairy and slightly lumpy, coiled only at the tip. 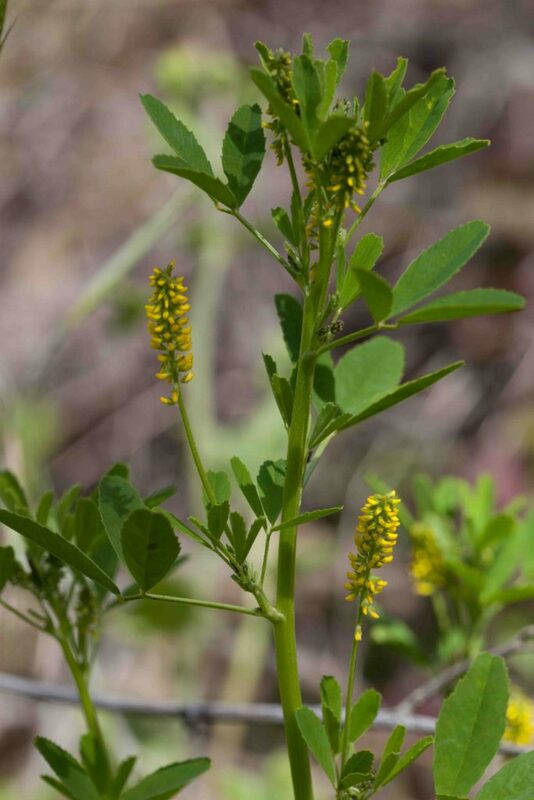 Widely cultivated and prized for its delicious sprouts, this occasionally escapes. 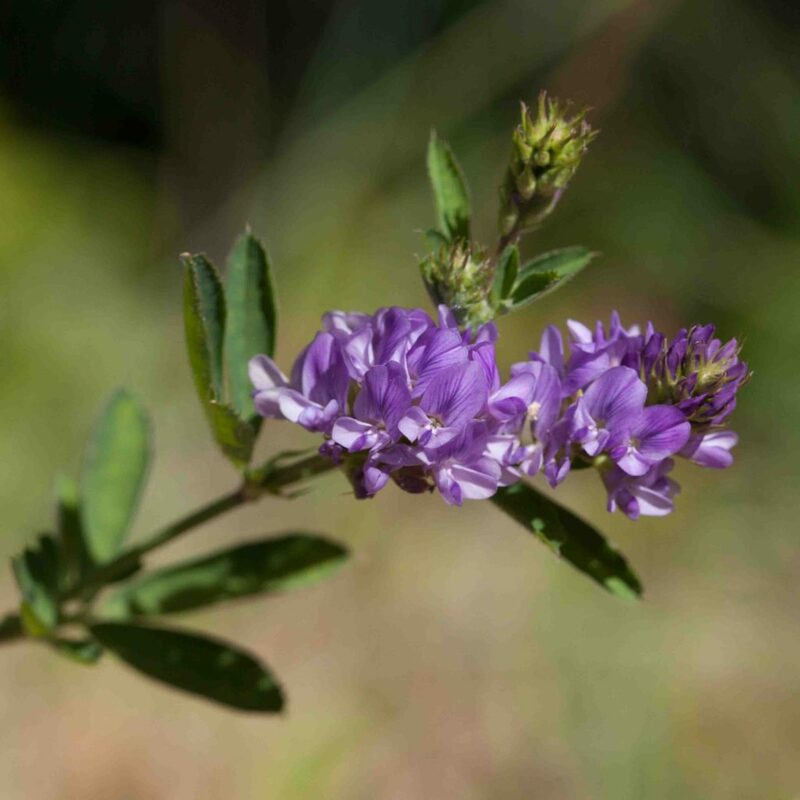 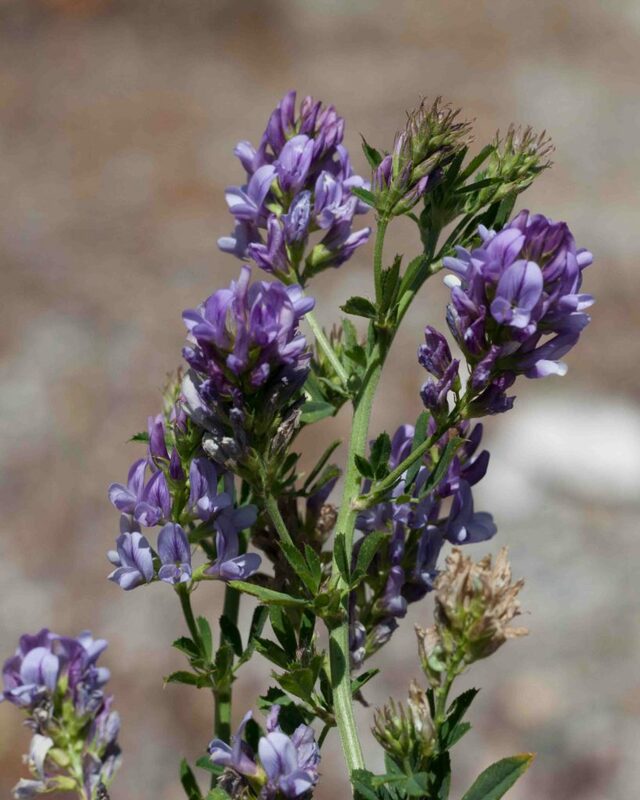 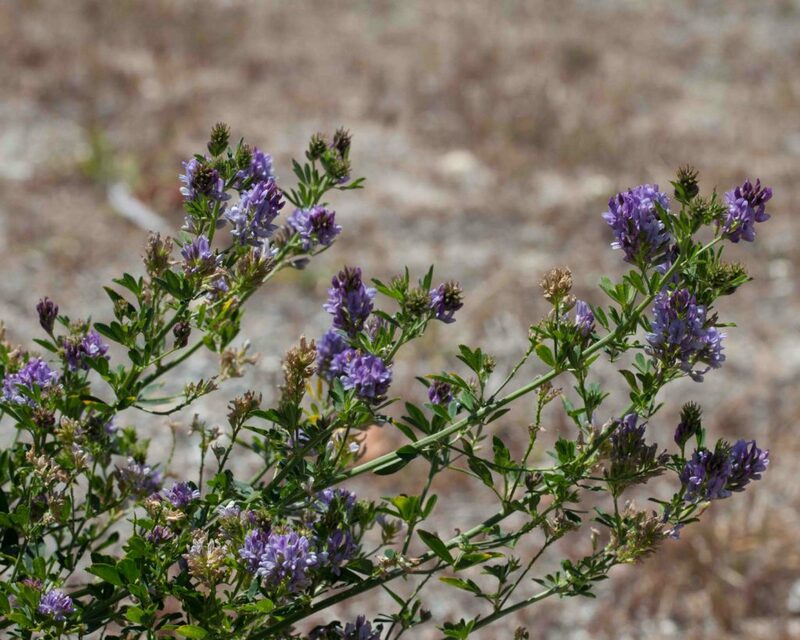 It is a smallish shrub with clusters of bluish-purple flowers. 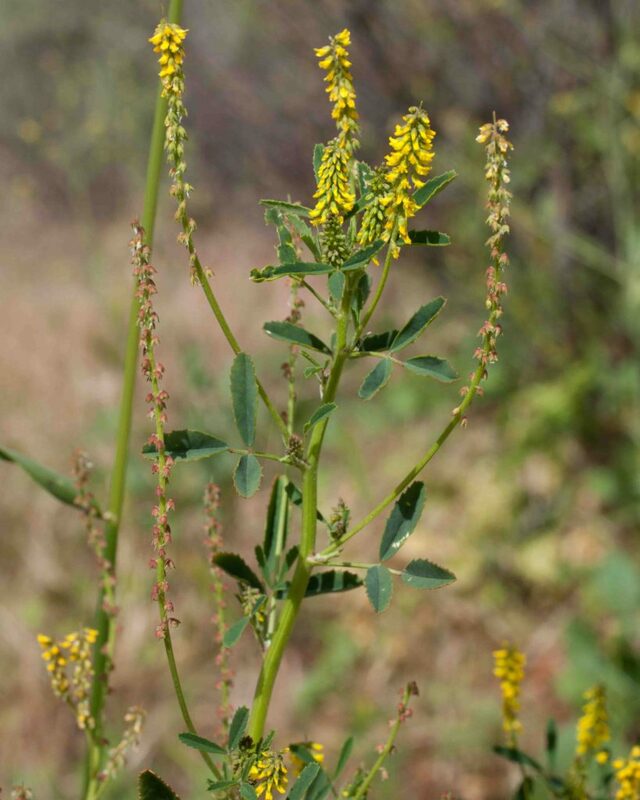 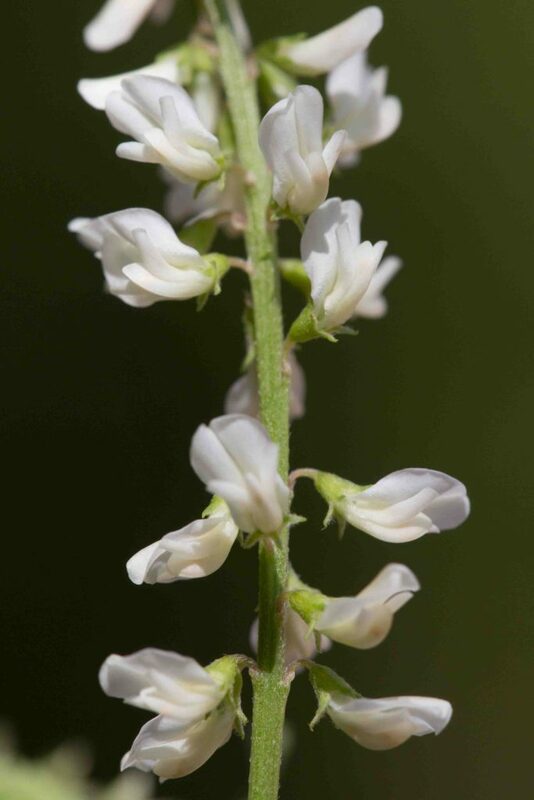 Related to the more common, weedy, Indian Melilot (Melilotus indicus), this is a taller plant with longer, more open inflorescences, white rather than yellow. 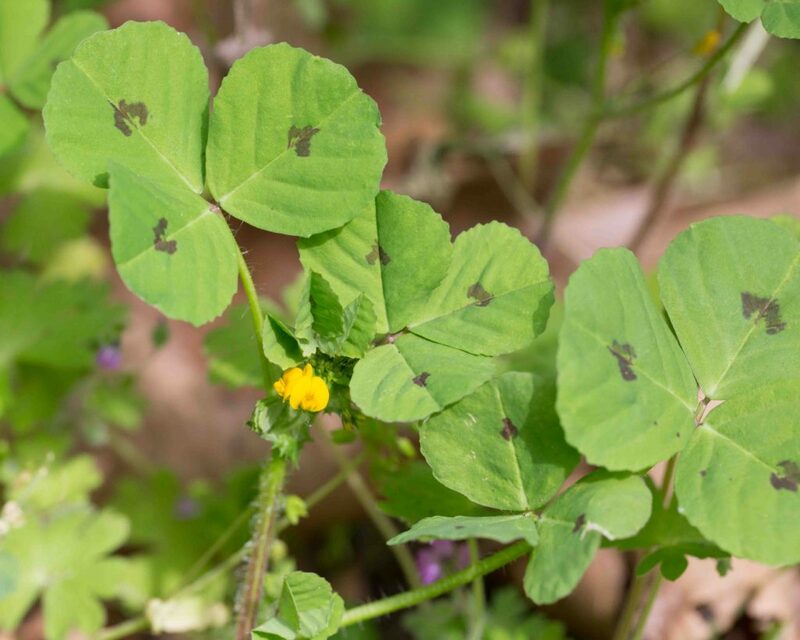 Leaves are in threes, oblong and not as obviously toothed as those of Indian Melilot. 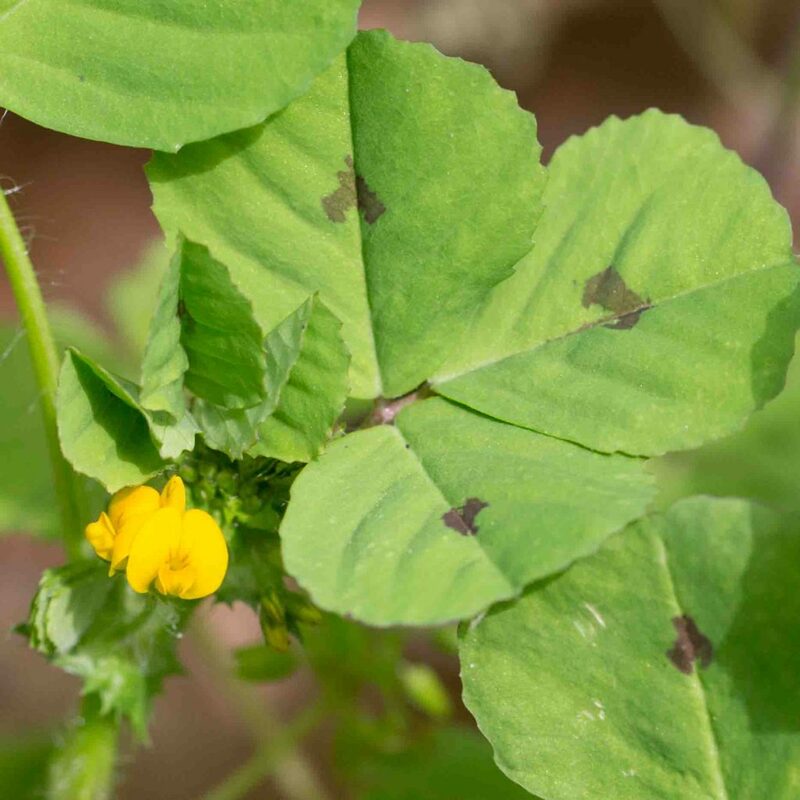 The fruit is an egg-shaped oval pod. 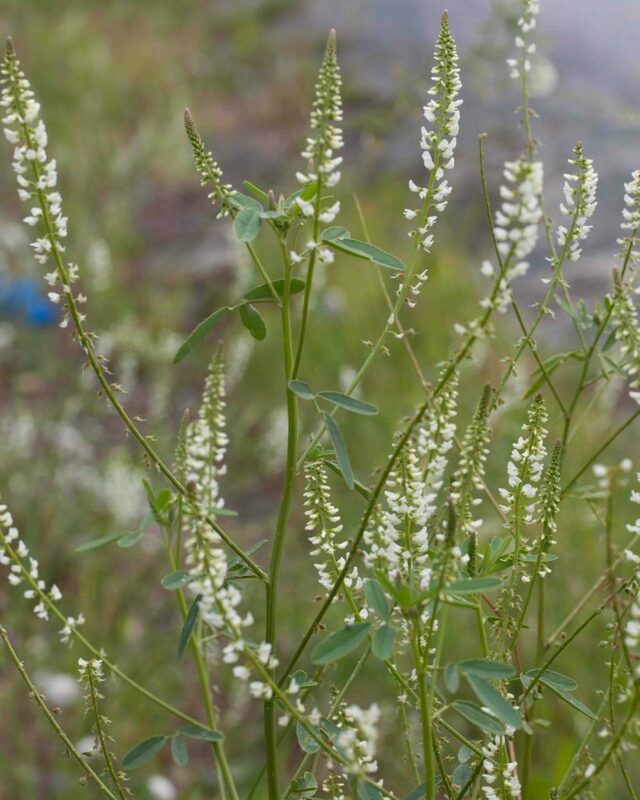 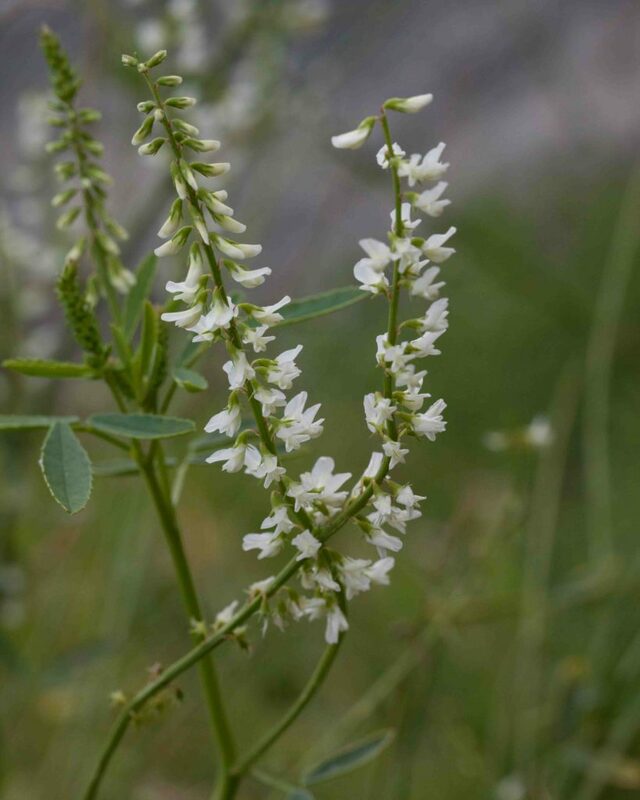 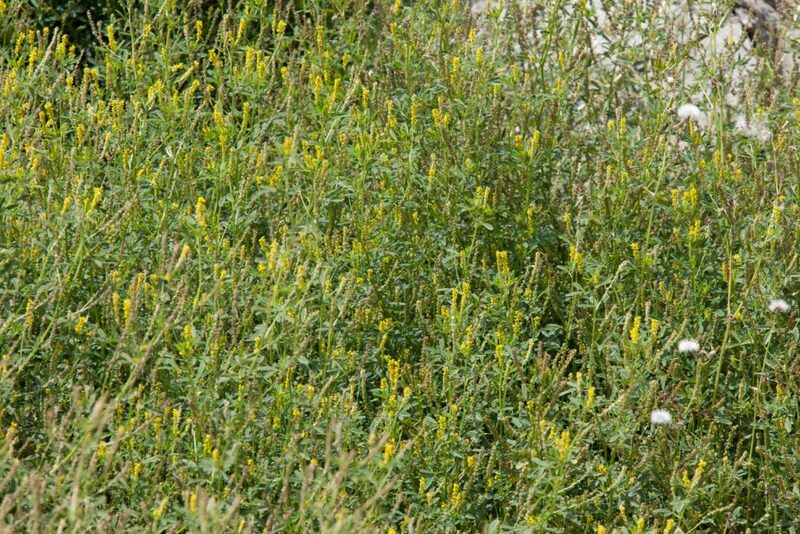 Like its white-flowered relative, White Sweet-clover (Melilotus albus), this has slender leaves and an elongated inflorescence. 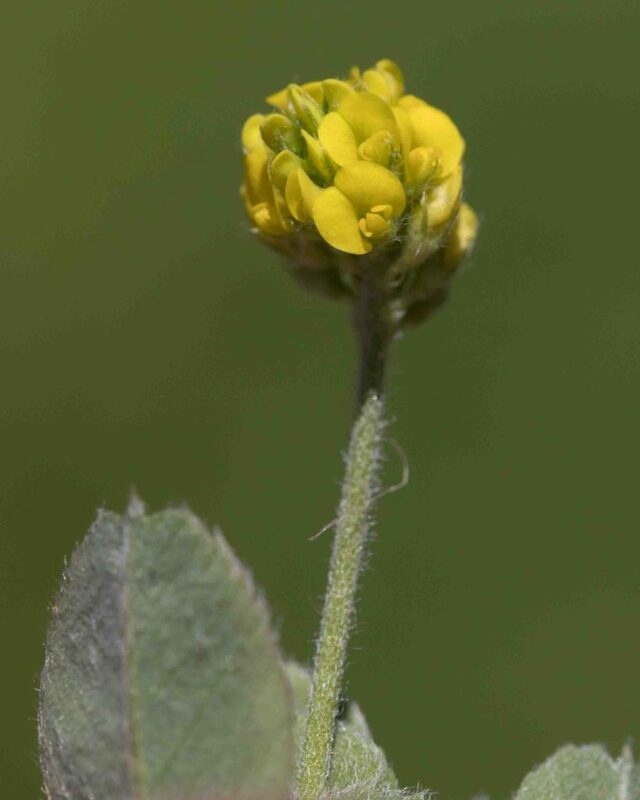 The flowers are more or less tubular, yellow rather than white and in smaller, denser clusters. 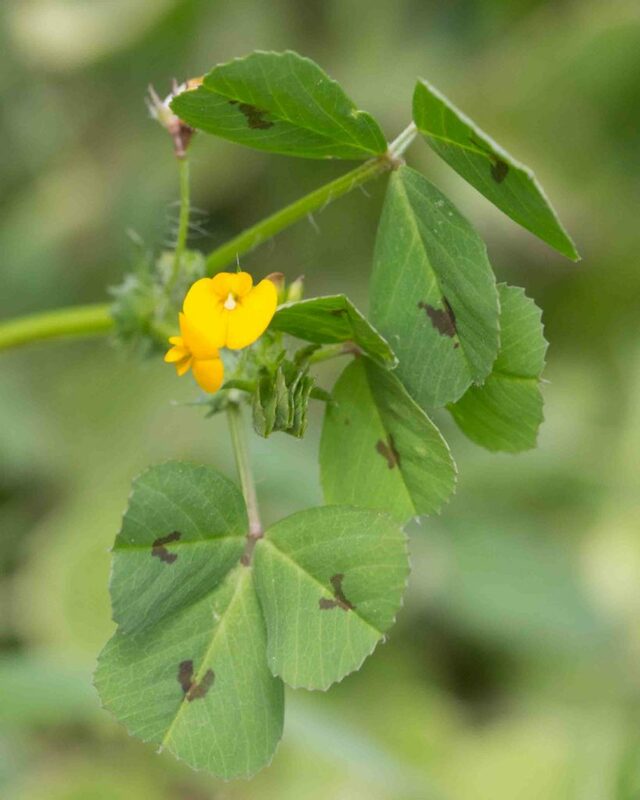 The leaves are conspicuously toothed.